With MR. BEER® mixes, you can enjoy your very own homemade batches of ice-cold lagers, light pale ales, and rich, dark malts. Whether you're a connoisseur or a novice, it's super-easy to brew up your own beer at home using quality ingredients to create a unique taste that's unlike any store bought beverage. 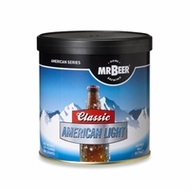 This MR. BEER® Refill Brew Pack produces one batch (two gallons) of all-malt style beer. This two-pack refill includes: 1 Can Classic American Light, 1 Packet Dry Brewing Yeast (under lid of HME), 1 Packet No Rinse Cleanser, and instructions. 1-year warranty. Constructed in the USA.